Today’s world is more and more referred to as being “networked” due to the advancement of ICTs but also because of the growing phenomenon of the involvement of non-state or non-governmental actors into policy- making, either in a consultative way or through the development of new participatory approaches, often enabled or enhanced by the use of ICTs. This is dispersing State power into autonomous local governance systems, while the industrial revolution in the past centralized it. The opportunity of using ICTs for communicating on a global scale has added new dimensions to possibilities for pursuing national, regional and local development; that is where economic and social impacts can be more valuable to the administration users and the citizens. Recognizing the importance of information for democratic and civic life, in principle, it is required to increase knowledge and information capacities to operate in a context where institutions and infrastructure are needed to facilitate the flow of information, its availability and access. Some indicates in a straightforward positive way that “Information and knowledge are closely intertwined: to produce information, a knowledgeable agent processes new findings and data, acceptable to society and the resulting commodity is the increase of knowledge through improvement of access”. In this way, “The increment in knowledge reduces uncertainty with regard to the organization of economic and social activities, providing the capacity to effectively use available information and reach informed decisions”. However, as a matter of fact, information is not knowledge neither competence. Information access and sharing, as well as expert data handling, necessitate a lot of knowledge. Information is not the first stage towards knowledge, neither the pre-condition of it. Often it is quite the opposite. Similarly, the increase of participation in the usage of ICTs is no automatic and linear step towards a deep, effective, sustainable or democratic evidence. On the contrary, one has to stress that to carry out a collective learning of some significance through ICTs, more horizontal processes, empowerment and trial and error linked with experience sharing must somehow take place “upstream” or at least considered quite early in an ICT-based project to constitute a democratic enhancement chance. 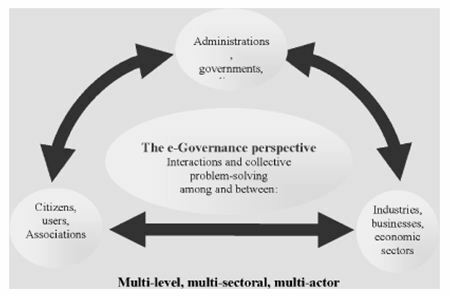 In this context, the relations between ICTs and governance are multiple. Governance supported by the development of ICTs can have more powerful information transmission, stimulate debate and participation and, at the same time, the establishment of information systems and knowledge management tools can facilitate governmental processes. However, it should be underlined that, when discussing integration of ICTs in administration, the focus is in the promotion of governance using ICTs as a tool, rather than the ICTs being an end in themselves. To this extent, it is necessary to identify and to try to define the basic concepts we are dealing with, from Government to Governance, at central and local level, and including the potential role of the ICTs as a tool for good governance as well as giving a perspective on how ICTs can enhance citizens’ participation. Government, a public organization – is part of a broader governance system. It is a means to a goal. The term “Governance” refers to a multifaceted compound situation of institutions, systems, structures, processes, procedures, practices, relationships, and leadership behavior in the exercise of social, political, economic, and managerial/administrative authority in the running of public or private affairs. Good Governance is the exercise of this authority with the participation, interest, and livelihood of the governed as the driving force. Local governments are administrative offices of an area smaller than a state. The term is used to contrast with offices at nation-state level, which are referred to as central government, national governments or (where appropriate) federal governments. 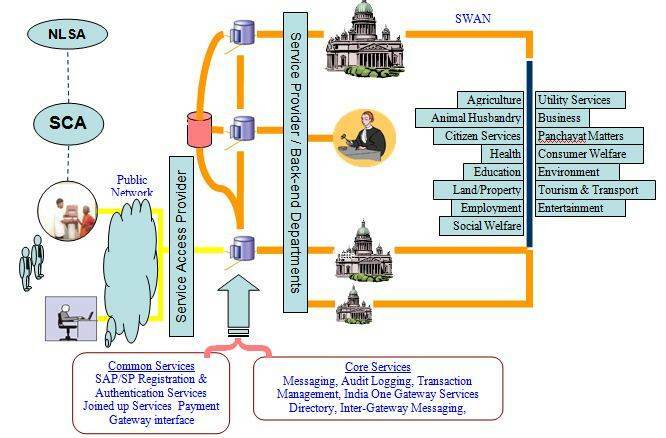 The overall objective of improving the governance systems and the performance of the public administration at all levels, enhancing the delivery of the public services to all citizens, can greatly benefit from the integration of ICTs in the process of decision making, planning, co-ordination and management carried out by governments. But what are ICTs and why should we integrate ICTs in the government process? 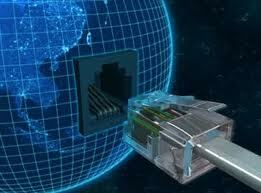 On a point of definition we talk of ICTs, adding “communications” to the more familiar “Information Technology”. This reflects the increasing role of both information and communications technologies in all aspects of society. Generally speaking, ICTs are defined by Stevenson in his 1997 report to the UK government and promoted by the new National Curriculum documents for the UK in 2000 as: “The study of the technology used to handle information and aid communication”. But what we are interested in, more than the study of technologies is the application to improve and “channel” information through any means of communication, based on different infrastructure. So it is important to understand what is information and what is communication. The World Bank defines ICTs as a generic term, which includes Information Technology (hardware and software) and the telecommunication infrastructure, equipment and services. In this connection, it is worth underlining the role of ICTs as a tool for development, and not as a goal in itself. Using ICTs can help achieve development goals. This is particularly true in relation to government operations and governance in general. The integration of ICTs in governmental operations introduces the concept of Internet Government, Electronic Government, Digital Government or – in short – e-government. – e-government is defined as a capacity to transform public administration through the use of ICTs or indeed is used to describe a new form of government built around ICTs. This aspect is usually linked to Internet use. Therefore, in a point of conceptualization, we must take into consideration the multi-dimensional aspects of ICTs when discussing e-governance. In this regard, in a simple but, in our opinion very effective way, e-governance can therefore be defined as: the Governance “with and of” ICTs. The development of Internet government and Internet governance takes place in a very specific environment and contextual pressure which we must understand and learn, in order to steer at best. This overall change can be identified as manifold, although producing a composed impact on our lifestyle, level of wealth and relationships, inter-regionally and inter-nationally speaking. Globalization appears as an emerging and constantly reinforcing process. Globalization is more than just the “mundialisation” identified by previous researchers, from Braudel to Wallerstein, rooted in Middle Age discoveries and expressed through successive expansions, themselves supported by ever more efficient communication means, up to the complete coverage and information production upon, of the planet as the ultimate cognitive object. Globalization is the effect of this building process in the sense that its overall power relationships (let us think about conflicts or the inequalities of means and performance), but also local initiatives may have an impact instantly or gradually on the rest of the world, thanks to highly interconnected processes and interests. It is, needless to say, that ICTs reinforce this process. Globalization can be perceived as a source of opportunities, as the scale for any activity tends to take place in a much broader arena than before, but also as a constant pressure, with positive and negative consequences. Economic competition, as a result of the previous phenomenon, became pervasive and almost a safeguard free paradigm, with significant consequences in terms of energy and material output, nature transformation and technology mastering, but also social and knowledge divides as well as damage at various scales and severe environmental threats ahead; economic competition is believed to benefit the customer, encourage innovation at all levels and, as a consequence, generate a better society. It also generates local shifts and undesired effects, with economic, social and cultural dimensions, to which remedies must be found. Public policy and more significantly political elites and leaders in major OECD countries have set up a framework for developing competition which goes even further, changing the rules of politico-economic regimes in a serious program trend called liberalization. State transformation, in this context, reinforced local means to express needs, projects and alliances in separate terms are growing in parallel with the pressure of globalization and transnational forms of economic competitiveness; it is therefore no surprise to see the state entering a phase of redefinition. Sovereignty is often at the core of the discussion, but fundamentally, what seem to be essential state prerogatives in most regions of the globe, are being rearranged: public service delivery can often be delegated, with the necessary reinforcement of policy making and regulation capabilities towards more efficient, ethically consistent supervision of services. It is of course particularly the case in industries traditionally owned by the state in many countries (telecommunications, energy industries, transport, health, etc. ), but also of more specific administrative services (let us think of geographical information systems for instance). In fact, the numerous e-activities, e-products, and e-services which are currently being displayed in the public sector cannot be fully understood, appreciated and assessed if they are not placed within the much broader framework of state transformation. 1. The growing emergence of non-state actors, basically transnational corporations (TNCs) and non-governmental organizations (NGOs). Increasingly, the state has to share its power with these non-state actors. Such power sharing is most pronounced at the supra- and at the infra-national levels. 2. The growing emergence of levels of managing public affairs, other than the nation-state level. I refer here in particular of the emergence of supra-national levels (EU, global), as well as of infra-national levels (local, regions). 3. The growing differentiation of the state’s three main functions, namely the service delivery function, the rule-making function and the regulatory function. These three functions can be increasingly treated as being separate from each other and therefore being shifted to the different levels and the different actors. These three movements are being combined with each other, which leads to the fact that public affairs become more and more fragmented (in terms of functions), diluted (in terms of levels) and outsourced (to non-state actors). There is, in particular, a deficit of cross-functions, seamless operations in which non-state stakeholders can play a proactive role. At the same time, enterprise-based and private individuals’ e-activities develop quite freely and increasingly. There is therefore a place for a different type of steering than the one e-government promotes. The Chittagong Customs House has been automated in 2008 in order to increase revenue and check irregularities through enhancement of its efficiency. – Promoting advanced technology and innovation – cyber port – university R&D (Science park) e.g digital media center, 3G, DRM, etc. Internet Governance is the next big trend occurring in India with at least half a dozen states jumping onto the bandwagon. While these are individual state government initiatives, they lack a national perspective. Yet, with the realization of the benefits of Internet Governance among the central and state governments, in India it can actually become a reality. This will enable a healthy citizen government interface. State governments who are jumping onto the Internet Governance bandwagon are taking initiatives in this direction. Clearly the southern states of Andhra Prades, Tamil Nadu and Karnataka have taken the lead in terms of implementing these projects at different citizen-government interface departments. Other states across the country have been swiftly moving to keep up with the changes in the south, and states like Rajasthan, Gujarat, Maharashtra and West Bengal have been trying to catch up fast. Also coming up are Kerala, Orissa, Punjab and Madhya Pradesh, to name a few. Work stations distributed in key departmentswhere the work of the department has been automated. Some information can be accessed from an Interactive Voice Response System. Those with an internet connection also can connect to the Web Server and retrieve information. The hardware components include four servers located in the municipal office and 18 clients distributed amongst various departments networked in a LAN. Each kiosk has two terminals with multilingual software. Application software such as Lotus Notes for grievance work and a GIS are used actively. Some of the automated functions include town and country planning, taxation, public health, estate, engineering, municipal budget allocations, birth and death certificates and registration of complaints. Apart from the huge volume of data that was required to be put in, the local officials resisted the move, fearing that an automated system would prevent all scope of bribery which constituted a substantial part of their income. Besides, it would talk a while to weak the system to the precise working requirements of the officers-so as to reduce time required for transition. The system has effectively reduced corruption, increased responsiveness of public officials with in the municipality. Besides, the system offers ready access to statistics pertaining to population and municipal assets. Overall, it has been able to increase efficiency of the urban local body at large. As stated at the beginning, it will be important for government to continue to use the nomenclature of internet government, internet governance and internet democracy for a number of reasons. This is a growing subject matter and it is essential that governments create harmony and consistency in any evolutions being undertaken. The growth of ICTs and programs, implementing old and new technologies, requires a continuous stream that can be understood by the public. The pillars of public administration, evolved and articulated over the past three to four centuries, have created a professional and modern public service. This evolution has come about through careful debate, trial and error and implementation. Change as has been needed as public service organizations around the world grew to cope with the challenges of the modern world. Public Administration as a discipline is recognized and accepted in academic and public sector institutions worldwide. 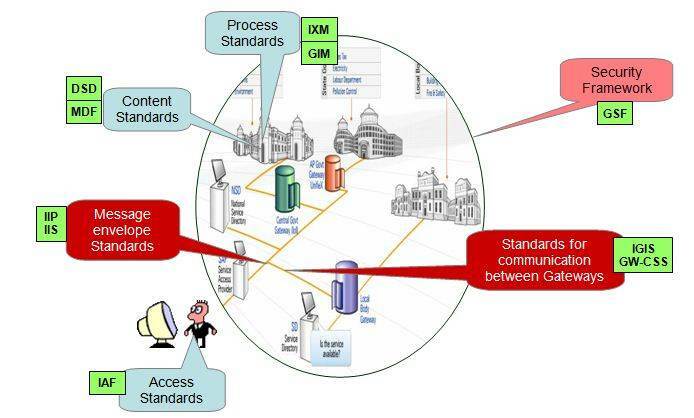 The pillars of Internet government and Internet governance are now being defined and considered as the natural extensions of the sound methodologies of how government organizations should be run. It is recognized that while the rapid evolution of new technologies have created challenges for all governments, sound administrative principles are the order of the day. It is not a question of throwing out all that public sector has developed over the past hundreds of years but rather taking the tried and true principles of public administration and applying them to the “e” world. Governments by nature are conservative organizations and slow to adapt to change. In the private sector slowness in adapting to change can be disastrous for a company who may have to close up shop because of poor administration, bad administrative practices, errors in judgment about changes within their company, or misreading of the public mood. Companies are very much subject to the winds of change. Internet government can be a more productive version of government in general, if it is well implemented and managed. Internet governance can evolve into participatory governance if it is well supported and architected. What stands in the way of good Internet government and Internet governance is establishment resistance from many who do not wish to change the status quo, and public cynicism, the latter being a much larger issue above and beyond e-government and e-democracy. Given the way that technology developments are currently shaping public expectations however, citizens will continue to expect more as new states of technologies evolve. The transition to participatory governance will probably be slower, messier and costlier than it need be, but democracy always has been somewhat chaotic.